Apple shares dipped below $100 in pre-market trading today amid a wider Dow Jones and stock market downturn, with AAPL fluctuating around the $98-$100 mark prior to the New York Stock Exchange opening bell at 9:30 AM Eastern. Apple shares last dipped below $100 in October 2014, four months after opening at $92.69 following a 7-for-1 split that took effect in June 2014. Apple shares closed at $105.76 on Friday and are down over $35 from a 52-week high of $134.54 set on April 28, but many analysts remain bullish about the stock and believe that the current dip presents a buying opportunity for investors. The company is expected to announce new iPhones and iPads alongside the launch of iOS 9 and OS X El Capitan through the end of October. 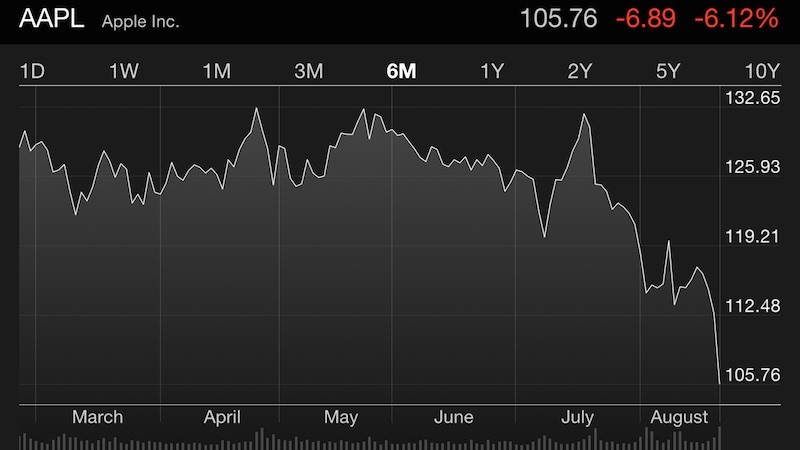 Last March, Apple replaced AT&T on the Dow Jones Industrial Average, which is currently down over 500 points. The Dow Jones provides a price-weighted average of 30 significant stocks traded on the NYSE and NASDAQ, including American Express, Boeing, Chevron, Coca-Cola, Disney, Exxon Mobil, Goldman Sachs, IBM, Intel, JPMorgan and Chase, Microsoft, Verizon and Visa.